5th April 2011 Review of a Review of Ascension! While I was here I thought I would do something. A week ago I came across a review of the Immortals Handbook: Ascension on RPGNow. You can read that review here. Anyway, I basically decided to review the review of my book, you can read my thoughts here. 5th April 2011 Did you miss me!? Okay, probably not. I am basically using this website for an remaining 3E material. Given that most of my 4E work is on the new Eternity Publishing Website. 20th December 2010 Gods & Monsters (3.5E) free pdf release! You can download a copy of Gods & Monsters here. The pdf is MASSIVELY unfinished which is why I am giving it away freely. Basically Gods & Monsters was the bit of Ascension which had all the sample Deities like Surtur and Metatron and was planned to have some new monsters as well. 20th December 2010 Where have you been!? As most of you will know I have still been on the forums. When I created my new website (update of that hopefully tomorrow) I realised I was spending far too much time updating it and not enough time working on the Vampire Bestiary. So I sort of panicked and did the complete opposite. Anyway, in future I'll try and balance the two things much better. So where is the Vampire Bestiary I hear you cry!? Well, its almost finished. I should have full text within a few days time and full art in a few weeks time. So pretty close to a release but this being me, lets not break out the champagne just yet. 27th September 2010 COURT OF DEMOGORGON! I have added several updates to the new website here. The latest being the first of a two part article on Demogorgon. The second part should be up tomorrow. 12th September 2010 NEW ETERNITY PUBLISHING WEBSITE! You can find the new website here. I will be keeping this website (for the forseeable future), but most of the future updates will be on the new website. The new website has four new articles, and I'll try to add four new articles every 2 weeks. You can now make comments within the articles (which is kind of neat) so let me know what you think of them. In other news, I am now on Facebook. Sadly I cannot give you a link to my facebook page because other people have the same name I do (Craig Cochrane). But if you search the name on Facebook you should be able to find me easily enough...I'm the one using the camera-phone in my Avatar pic. 1st September 2010 Galactic Gods & Planar Pantheons! All pantheons are not created equal, here's why. 1st September 2010 New website very soon! I'm working on a whole new website, its looking pretty swish at the moment although still getting to grips with the new format and controls. I think this one is a bit bland and outdated, and I know the layout goes wonky for people who don't have the proper fonts - which most of you probably don't. I will still be keeping this website around for a good while though. I have a couple of articles on the new website at the moment; some old, some new and I hope to have everything up and running by this weekend. I'll be sure and mention it here and on the ENWorld Forums. 18th August 2010 Fixed problems with Slave Gods & Pantheons! Updated this article after some feedback. Should have the sister article Galactic Gods & Planar Pantheons up soon. 2nd August 2010 Slave Gods & Pantheons! ...Conflicts between the gods can cause whole worlds to crumble and planes to crack and buckle under the strain of such titanic energies unleashed. But when the dust settles and the smoke clears...what then? Are these always contests to the death? Lets find out...here. The first part of a two-part article for both 3rd Edition and 4th Edition. 10th July 2010 Updated 4E Expanded Damage Tables! As some of you know. Wizards of the Coast updated the DMG damage tables in their July errata. As a consequence, I have updated my own expanded damage tables here. This brings higher level stuff into line with Monster Manual 3. I will of course be updating the Vampire Bestiary with all the new design parameters. 10th July 2010 Some (Slight) Good News! Okay, apologies for the lack of updates. Its clear my current work schedule is completely wrecking any progress so the good news is that I have cut back the hours of my other job to give me far more time to concentrate on my writing. As a consequence I'll basically have a 10-day 'holiday' every two weeks. That should be more than enough to start making some serious headway. This all kicks in nearer the end of this month. So from that point on I'll try to not only get some work done but make a point of weekly (or at the very least bi-weekly) updates to this website. 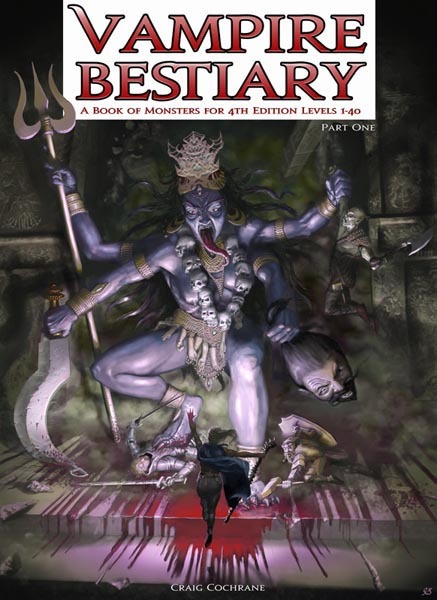 As for the Vampire Bestiary itself, expect massive changes to the format, which I'll explain on the Vampire Bestiary FAQ, as well as a (fingers crossed) much sooner release. 27th May 2010 Vampire Bestiary Latest! Yes it isn't finished yet, sorry. But I am pretty close to having it done. As soon as I get my bearings back together again (only found out the website was online again 10 minutes ago) I'll sort out some new previews for it. In the meantime I have updated the Vampire Bestiary FAQ, this does include some pertinent information including the growth of the book forcing me to divide it into two books (with each larger than the original 64 page book it should be noted). Here is also the prototype for the cover text, not sure about the framing of the main text. Let me know what you think. One mistake I made with both Ascension and the Epic Bestiary was that the cover text was difficult to read at a distance. 27th May 2010 Website Back Online!? Don't ask what happened to the website over the past 5-6 weeks. For some reason it went down at the start of April and I couldn't get in touch with the webspace provider. I was basically about to change providers tomorrow when someone informed me the website was back up again. I'll try and contact the webspace people again and hopefully I can get through to them this time. 17th March 2010 Vampire Bestiary EPIC TIER PREVIEW! Here are the stats for the Cherufe a Level 30 Elite Soldier. If you can't stand the heat stay away. 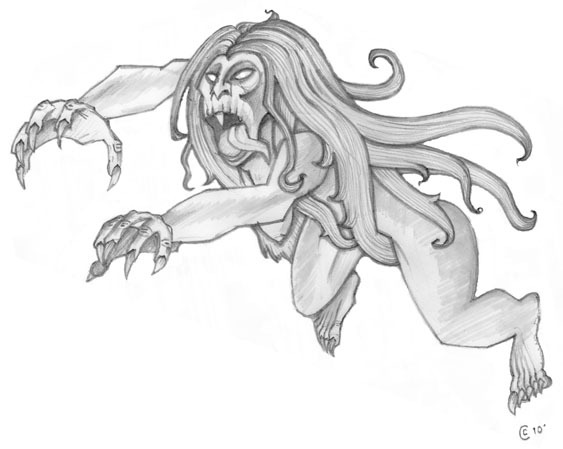 15th March 2010 Vampire Bestiary EPIC TIER ART PREVIEW! Apologies for last weeks lack of an update I think I must have slept basically all last week. One of the perils of night shift. Anyhow, here is the Cherufe (Volcano God), as ever stats to follow tomorrow. I should note that this illustration has not been cleaned up in photoshop yet, so there may be a few grey guidelines I still need to erase. 2nd March 2010 Vampire Bestiary PARAGON TIER PREVIEW! 1st March 2010 Vampire Bestiary PARAGON TIER ART PREVIEW! 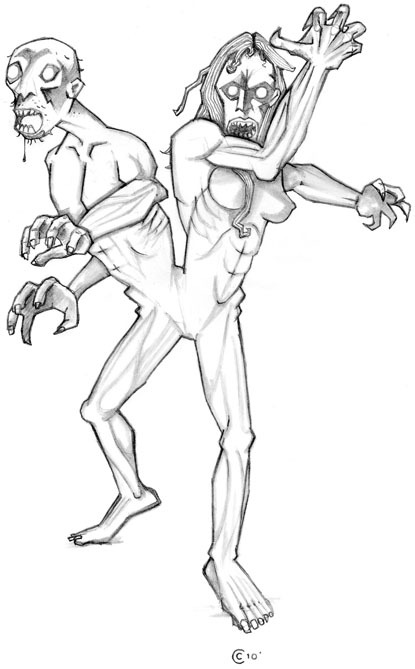 Here is the art for the Bisomus (Twin Wight), foul undead created by the cultists of Kali by burying alive two lovers in their final embrace. Its a Level 12 Elite Skirmisher. I'll spread the updates out a tad more (its easier to do) so I'll throw the stats up online tomorrow. 28th February 2010 Vampire Bestiary FAQ! Just added a FAQ for the Vampire Bestiary here. Also I changed the link to the Pey preview. New Paragon Tier preview tomorrow; which will be the Bisomus (Twin Wight). 22nd February 2010 Vampire Bestiary HEROIC TIER Preview! 21st February 2010 Vampire Bestiary HEROIC TIER ART Preview! The plan is to have at least one of these previews for a different tier every week leading up the the eventual release date. I will have the stat block up tomorrow (can't just copy and paste it and I am pushed for time), for now here is the art of the Pey (Forgotten Vampire). The inspiration for this picture was without a doubt the old Banshee illustration in the Fighting Fantasy book; Caverns of the Snow Witch. Anyway, hope you enjoy, and check back tomorrow for the stats. 21st February 2010 Vampire Bestiary Update! Okay, my last speculation on the release date was a tad optimistic. I am trying my best here, which may not be good enough but will have to suffice for the meantime. We are talking a matter of weeks rather than months though I can assure you. 23rd January 2010 Vampire Bestiary Latest! I have also changed around the start dates for The Serpent Riders Delve/Adventure and the Immortals Index: Canaanite Mythos. Basically I was just further ahead with the former and with time being pressed with getting the Vampire Bestiary done, something had to give. So I'll be starting my collaborative projects (beginning now with The Serpent Riders) as soon as the Bestiary is completed. 23rd January 2010 Godzilla (4th Edition)! Didn't realise it was so long since my last update, here are the stats for Godzilla, which I think I've been sitting on for a few months...oops. 12th December 2009 Black Hole Dragons, Demiurges and Time Lords! Just wanted to bring your attention (if you were not already aware) to the sterling work on the forums from ENWorld poster's Belzamus and paradox42, who between them have created some fantastic new gods and monsters. 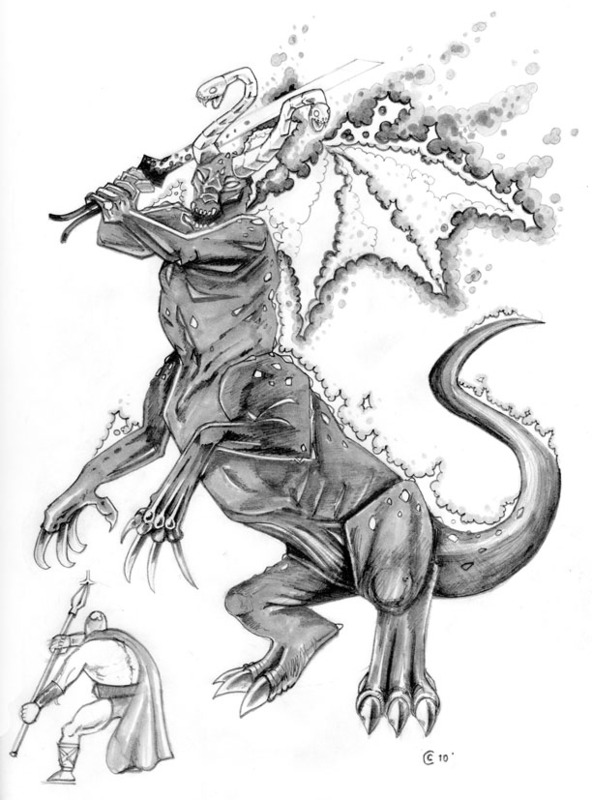 So click here to read about Belzamus' fantastically powerful and evocative Demiurges and Time Lords, or here for paradox42's mighty Nehaschimic Singularity Dragons and Quasar Dragons. But wait a minute, how can you hope to possibly stand against those I hear you cry!? You might want to gear up by reading Khisanth the Ancient's new armour special abilities here. Special thanks to all three and all the other contributors to the forums. RPGNow are starting a print on demand service. That should mean a print release for the Immortals Handbook: Ascension (3.5E) will be available. I'll have the full details soon. Also it means all future pdfs will be available as Print books from day one of their release. 10th December 2009 That Vampire book...whats it called again!? As regards the Vampire Bestiary, I have basically 6 weeks holiday from work from the end of December. That should be more than enough time to get that book finished and have the prep done for the first two books of the collaborative process. 10th December 2009 Third...Whats happening!? Well, what you may or may not know is that in late October I made an open call for writers to help with future Immortals based books, as its obvious I just can't cut it on my own while working a (30 hour/week) part time job. The idea was to have three additional writers on each book. I would write the first 25%, then they would use that as a template and in addition to some notes from me, each writer would write their own 25%, while they did that I would do the interior art. Each project would be relatively small (about 64 pages) to further help hasten the release. So I have had all the responses, and to be honest, its difficult to chose between them, because a lot of the applications were very similar. So what I am probably going to do is give each of the applicants a chance. So, following the release of the Vampire Bestiary (fingers crossed in January). I'll be starting work on four other projects. I'm guessing a turnover of about 2-3 months may be possible for each pdf/book. Although if history has taught me anything, there will likely be somehing that gets in the way. Okay, here is the usual apology for taking so long between updates. In my defence, as a result of the previous trouble (see below) I had to rebuild several months of website updates since my last save on my new computer was late 2008. Fortunately (from my perspective) I hadn't been updating much, so it wasn't too much of a chore. Not the usual apology for taking so long to update (I'll get to that in a moment), but rather I'd like to apologise if anyone accidentally downloaded a virus from this website a few months back (between late August - early October). I didn't realise it at the time but my website was being hacked, and the culprits had left a virus on this main page that auto-downloaded a very nasty virus onto the computers of anyone viewing this page (but not the other pages of this site). I myself had my old computer completely wrecked by this (fortunately I had been meaning to retire the ten year old machine months earlier, so it was no great loss). But I feel pretty bad about it, even though I was not to blame, I still feel responsible. Hopefully this won't happen again, but just remember that there are no downloads, no advertisements and no pop-ups on this website at all. If anything ever tries to download or asks you to download something from this website, it can only be a virus or some form of hacking. In such cases report the problem to me via the forums at ENWorld and don't revisit here until you are given the all clear on the forums. If I ever have files for downloading, I'll make them available personally or thru ENWorld or RPGNow. Again, sincerest apologies, and I hope no one was too inconvenienced by the episode. 11th October 2009 Against the Reptile God!? Although its certainly a few months down the pipeline I just thought I would let you know I am changing the format for this adventure. Instead of a straight adventure for Levels 31-35. It will be a series of 'Delves' for Levels 24-37 (or thereabouts). A Delve is like a mini-adventure of 2-5 encounters in length. Anyone familiar with something like WotC's excellent Open Grave book will have a rough idea of what a delve comprises. However, each of my delves will be interlinked. So you can play them as individual set pieces or link them all together to form a big adventure. The spread should also be good enough to accomodate Epic Tier characters or my (eventual) Legendary Tier rules. 11th October 2009 The Vampire Bestiary!? I have a first few weeks off in November and I will try my darndest to get the Vampire Bestiary completed (or at least to the editors) by then. I have expanded it to take into account Levels 1-5. So it covers the full spectrum from Levels 1-40. 11th October 2009 Website Problems!? You may have noticed the site was down for a few weeks at the end of August and again for the last week of September. I have had a few bandwidth problems lately, but all thats hopefully sorted now. I have tidied up the front page, and bumped the 2007-2008 news into their own archive pages. I am also planning a few updates for this week including a 4E conversion of Godzilla and possibly a revision of the Cloverfield Monster (which should really be Level 31 and not level 36). 16th August 2009 Dimensional Magic Article! Here is the first of (hopefully) a series of Dimensional Magic articles for 4th and 3rd (3.5) Edition. 9th August 2009 Vampire Bestiary Cover Illustration! Here is the Vampire Bestiary cover illustration. Hope you like it. Its by artist Joe Slucher. Joe is going to be at Gencon next week so if you see him, thank him personally from me. 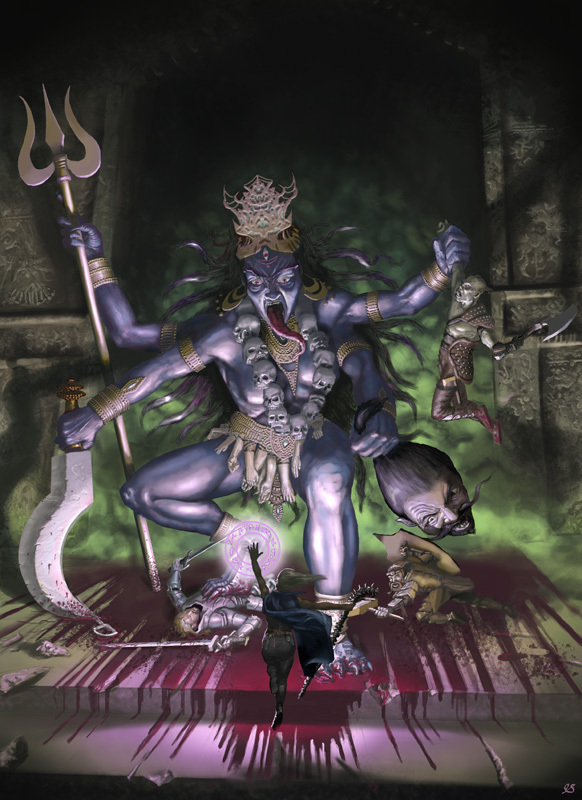 The cover itself is of the goddess Kali (who is detailed in the book along with her vampiric Dakini servants) battling my iconic immortals. I'll try and keep the Vampire Bestiary updates and previews coming at least at a rate of one a week...although this being me, if history has taught us anything that may not be set in stone. 2nd August 2009 Small Updates! In better news, the artist has sent me the cover to the Vampire Bestiary, and as soon as the payment transaction has taken place, in a few days time- (I'm waiting for my Paypal Transfer to clear) I'll post it on this website (assuming I can actually figure out how to post images again). It looks brilliant - far better than my covers. 11th July 2009 So How Will The 4E Legendary and Immortal Tiers Work...? Just thought I would take a brief moment to clarify how I'll be handling the Legendary and Immortal Tiers. Portfolio Paths will replace Paragon Paths. There will be four Portfolio Paths for each portfolio (one for each role). You will be able to Multi-Path by taking Divine Abilities. Characters with ability scores between 31-40 will be able to draw upon Unearthly [Ability Score] Powers/Utilities. There will be at least half a dozen new (Epic/Legendary) races but I am also working on the idea that your Pantheon will act as a sort of defacto 'Race' (mechanically that is). Dimensional Destinies will replace Epic Destinies. There will be at least six Dimensional Destinies. So at the end of your Dimensional Destiny you become an Elder God/Overgod. Instead of gaining more Feats you will gain Divine Abilities. Each Divine Ability will replace a feat. Characters with ability scores between 41-50 will be able to draw upon Impossible [Ability Score] Powers/Utilities. Hypothetically you could conceive of a Sidereal Tier (Levels 51-60), an Eternal Tier (Levels 61-70) and a Supernal Tier (Levels 71-80), however, I'll be lucky to get to the Immortal Tier (given my track record) and I can't really see too many people wanting to roleplay overgods and above anyway. Some I'm sure, but maybe not too many. Also, the second problem remains that each tier needs at least 100+ monsters to even make it worthwhile and I envision even I will run out of monster ideas at some point and given that by Level 50 you could be battling Demiurges and even Time Lords the thought of creating 100+ adversaries more powerful than Time Lords is a daunting one to say the least. Missed me!? Okay, probably not. But I finally got the website sorted out. Or at least sorted out enough to update. You may notice that all the images are down. Thats temporary. I'm using a new system to upload the website which is even easier than that last one...provided you already know what you are doing...which I don't. So I am not sure where the image files go just yet, I think I have to create a new folder or something. I'll email the tech support shortly and hopefully I can get that sorted within a day. I can't stress enough how great the new webspace people are, velnet in case you were wondering. They are about 1/6th the price of the people who took over my old provider. The big delay was simply a combination of trying to bounce questions off two support teams (webspace provider and domain name provider) while working the part time job. The Vampire Bestiary. This will be a 64 page 4th Edition book, with a 3.5E Conversion to follow. Its a monster book for levels 6-40. Yes thats Level 40, and while I know you can't exactly use material more than about 5 levels of difference in 4E, making Level 35 the current upper end of the official spectrum I want to start introducing a few monsters in products that rise above the norm, for a few reasons. Secondly, I want to prep the ground for the eventual Legendary Tier (See the Immortals Handbook below). As I see it you need a minimum of ten new monsters per level to make playing at those levels worthwhile. The Vampire Bestiary is about 2/3rds written and I have begun negotiating with the artists. However, one problem as I see it is that I won't be able to afford to commission all the art in the book (Looking at the math I would have been giving away at least 70% of the profit to the artists). Which means I will have to do at least half the art myself. Which will slow things down a bit. I was hoping for a mid-August release but if I have to do 8-10 illustrations thats probably going to set that back a month or two. Initially I was going to have a bunch of cannibals and a few other monsters filling Levels 1-5, but those may have to be removed. If they end up getting cut I'll release them here on the website. The Immortals Handbook: Legendary Tier. The 4E successor of Ascension. I have made some changes to the design. Notably that this will continue Class Progression (instead of the previous idea where Portfolios replaced Classes). The Portfolio Paths will replace your Paragon Paths. The Legendary Tier covers Levels 31-40. Ultimately I want to go higher than 40, but I think its best to limit myself for this first book. Speaking of which, I may release the expanded Classes as standalone pdfs rather than wait to get them all done in a larger book. These would be very small 8-12 page pdfs that I could sell for maybe $1. Not sure how valid an idea that is because technically you wouldn't strictly be able to use a Class without a Portfolio Path. So perhaps I'll release one Expanded Class and one Portfolio Path at the same time, then alternate between releasing a new class or a new portfolio every few weeks (more likely every month knowing my rate of knots). I suppose there could be a quick 'primer' that included the basics along with the first expanded Class (probably the Fighter Class to begin with) the first Portfolio Path (probably the Fire Portfolio to begin with) as well as the new rules for Legendary Ability Scores - in effect when your ability scores reach 31-40 you get new powers. This idea would replace the need for portfolios based around ability scores. The initial Classes will probably follow the 4E Players Handbook (I'll do the fighter first, but after that I suspect things will proceed alphabetically). The initial portfolios will probably be: Fire and then seven others from the following list ~ Sky, War, Death, Sun, Sea, Luck, Magic, Nature, Love/Fertility, Animals, Moon, Earth, Craft, Sin, Archery, Justice, Thieving, Chaos, Darkness, Rulership, Poetry, Protection, Travel, Winter, Community, Healing, Pestilence, Wealth, Sleep/Dreams, Labour/Farming. L1: Against the Reptile God (Legendary Tier adventure for Levels 31-35). I am well ahead in terms of prepping this adventure. It will contain about 68 new stat blocks, including a handful of deities. One thing I have noticed is that because no monsters for these levels exist already (or very few) it means I'll have to create them all. So this is basically a combination of a new Bestiary and an Adventure. To put that in perspective, Wizards of the Coast adventures usually have about 10 new monsters and maybe half a dozen NPCs. I have 54 new monsters and 14 NPCs. So it will likely be released in three "Acts", each containing about a dozen encounters. I am due four weeks holiday in May, so I'll be working away like a crazy person to get Gods & Monsters - Astral Plane: Epic Tier written, so that I can commission the artwork from the artist(s). Hopefully during that time I will also get around to more website updates. If things go to plan (which they almost never do for me) I may also get the Immortals Index - Bronze Age: Canaanite Mythos written during that time too...fingers crossed. As for the Bane update. I'm still sitting on it. I just don't feel entirely comfortable releasing something as derivative (since D&D insider is a monthly subscription), so I'll either change it dramatically or keep a lid on it. Still want to say thanks for the person who sent that in though. In other news, I have recently been contacted by my new webspace provider (who bought out the old company) and they are asking for a 300% increase in costs. I have asked them to make me a counter offer as I don't feel comfortable paying that much. But if that falls through my website could be down for a week (at the start of May) while I get a new provider. Sorry about the lack of updates, just been sidetracked working on the books. Godsend is slowly taking shape and the Gods & Monsters - Astral Plane: Epic Tier (yes, slightly tweaked format, the first third of that pdf will be Epic tier mostly 21-35 ish, the second mainly Legendary Tier and the third predominantly Immortal Tier) book is coming together very nicely. I wonder if I have to be signed up to the GSL before I can release a preview for a 4E product (I'll find that out for next time). As to the update itself. Its the beginning of a table on Revising Epic Monster Damage (4E) and why those attacks are sub-par in terms of dealing damage as set by the design parameters in the new 4th Edition Dungeon Masters Guide. Click here to see whats up. You may also notice an inactive link to a 4th Edition version of Bane (full god stats naturally). I don't have D&D Insider where WotC previewed Bane's two Aspects and Exarch Maglubiyet (Level 32 Solo Brute). However, a fan of the Immortals Handbook does subscribe to it and he sent me his own version of Bane as a 38th-level Solo Soldier. However, I felt a bit uncomfortable just posting those stats because it turned out they were fairly close to the Aspect simply with the dials turned up to eleven. So I have taken it upon myself to make some changes...hopefully for the better. I'll post it in my next update. Okay, can confirm, I did manage to get my computer sorted and I now have InDesign CS4 good to go. Was toying about with it for a few hours earlier and luckily the basics all seem pretty familiar, which is good considering I've been using a 13 year old version of Pagemaker. Hopefully I'll be able to incorporate some of its lovely new features into future Immortals Handbook products. Special thanks to Alister Mathers for helping with my computer woes. 25th January 2009 Where in the Nine Hells have you been!? Yipes! Has it really been 145 days since my last confession? I mean update. I guess a sorry ain't gonna cut it at this stage. So whats been going on. Well, not much to be honest. Part time job just about wrecks any schedule I try and stick to. However, there may be light at the end of the tunnel as I am now on an extended vacation from work...how better to spend it than working on some new Immortals Handbook stuff. I have actually been off for just over a week already and have been doing a lot of prep for some typing up. Unfortunately a small hiccup in getting InDesign to work has meant progress is still at the writing rather than typing stage, but things are looking up and I should have that all sorted by tomorrow night. Fingers crossed. So whats in the pipeline...and remember this is me, so consider these words not exactly set in stone. I hope to have the writing typed up for two or three new pdfs before my vacation time ends. Probably one 3.5E pdf and two small 4th Edition pdfs. Now even if I have the writing done by the end of February doesn't mean those products will be on sale then. But it does mean I can commission art knowing I'm not going to keep artists waiting and while thats going on the writing will be at the editors. So things are slowly moving in the right direction. Thanks for sticking around. I also hope to have some juicier updates over the next few weeks and I'll keep you informed of progress on the writing front. 2nd September 2008 Cloverfield Monster for 4E! 31st August 2008 So Whats Happening!? Apologies for the severe lack of updates. As many of you might be aware, the Game System License (GSL) hasn't had a great start and Wizards of the Coast are meant to be in the process of revising it. In the long term I don't think thats going to be a problem. However, in the short term it has affected to a small degree in that I haven't as yet given the go ahead for my artists to start. Yes I did say artists. I now have two artists interested in working with me, so once I get my 4th Edition material underway I should be able to concentrate on the writing for the most part. Clearly Godsend is not going to happen in August now. However, I think I may be able to put together an early unillustrated version within two weeks. The plan at this stage is to give away the Gods portion of the book for free (probably half the book) but the full and final pdf will probably have a small price tag depending on how much makes it in to the final version. 20th July 2008 Elder Evils...well sort of! Was replying to an email about how to convert the Elder Evils to 4th Edition and I thought that might make an interesting short article for the website so I have added the information, here, at the bottom of the 3E to 4E Conversion table. I also added a little bit more to my D&D Movie script/synopsis, which you can find here. 20th June 2008 Expanded Damage Tables for 4E! Added another new table, here, for those looking to create their own 4th Edition uber monsters of Levels 31 and above. 19th June 2008 Future Plans for the Immortals Handbook! August 2008: Immortals Handbook: Godsend (3/3.5 Edition) - My farewell to 3.5, will include the gods part of of the previously titled Gods & Monsters, Version 6 of the CR/EL document, some new monsters from me as well as all the Design an Epic Monster Competition winners, will also likely include elements planned for Grimoire and Chronicle such as dimensional magic rules, new artifacts and divine realm encounter creator. November 2008 (tentative date): Immortals Handbook (4th Edition) - The successor to Ascension. February 2009 (tentative date). Gods & Monsters (4th Edition) - The successor to the Epic Bestiary (about 75% new monsters, 25% updated). May 2009 (tentative date). Immortals Index (4th Edition) - Almost certainly will be about the Greek Mythos. August 2009 (very tentative date). An Adventure - name undisclosed (4th Edition) - For Levels 31-33. I'll hold off on revealing any specifics about 4th Edition (though I am sure I have already explained the basics of 4E Immortality on the forums). I have tried to correct most of the pages on this website to reflect these new plans. Unless stated otherwise, all content © 2001-2009 Craig Cochrane. All rights reserved.